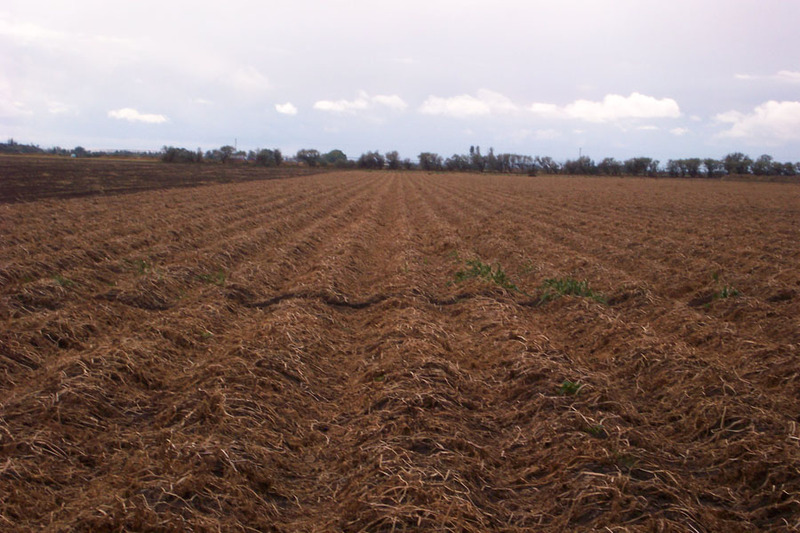 We started digging the first of the potato crop at the end of August. 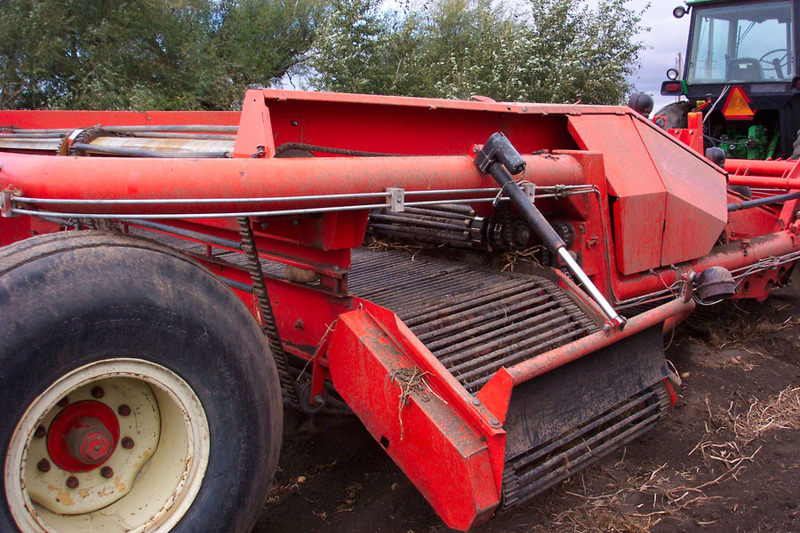 Several types of machinery make it possible to harvest potatoes. Below is a picture of a potato crossover. 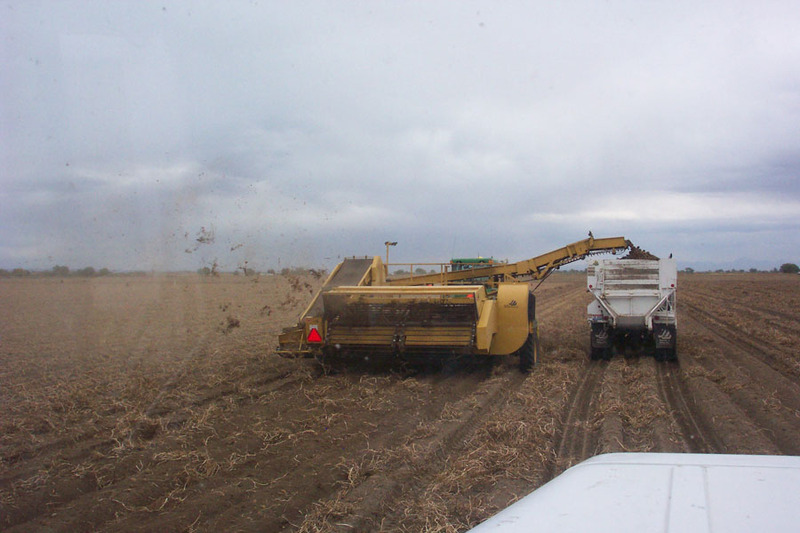 The crossover drives in front of the digger, digging, in this case, four rows of potatoes. 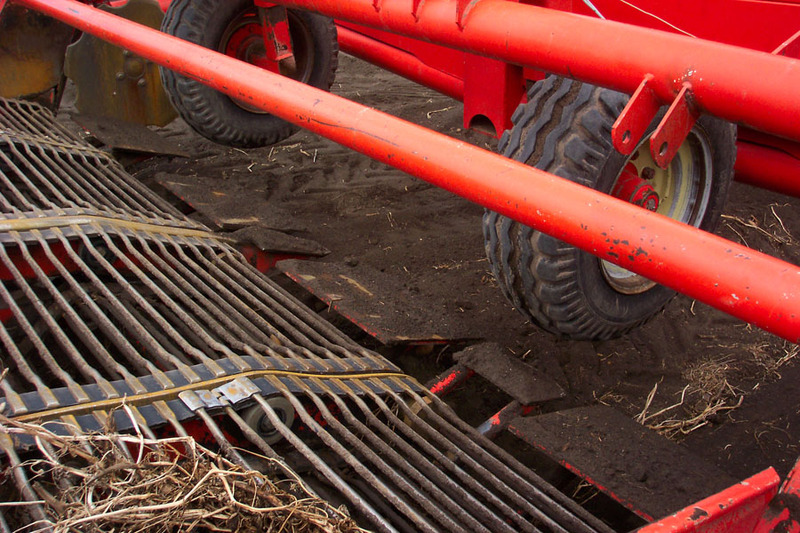 Blades placed on the bottom go under the potato rows (below), lifting the spuds out of the ground onto a series of chains. Those potatoes are carried back and then dumped on a cross chain. 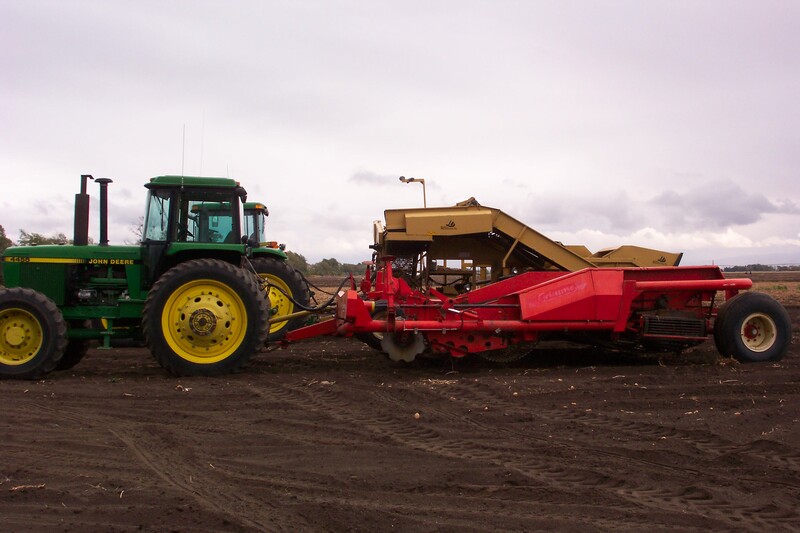 The cross chain then carries those four rows of potatoes to a boom that sits next to the ground, dumping them between two potato rows. 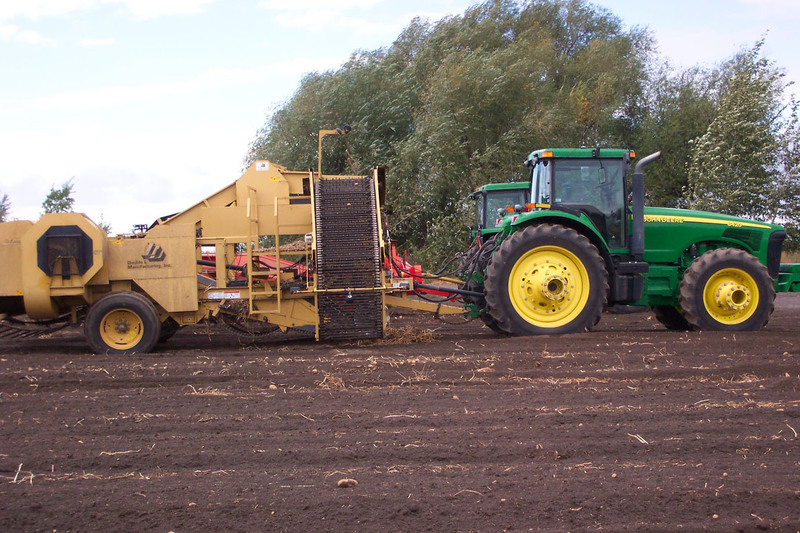 The digger follows behind the crossover, picking up the potatoes the crossover piled, plus, as least two more rows of potatoes (we have both a four-row and a two-row digger). The digger is set up in much the same way. 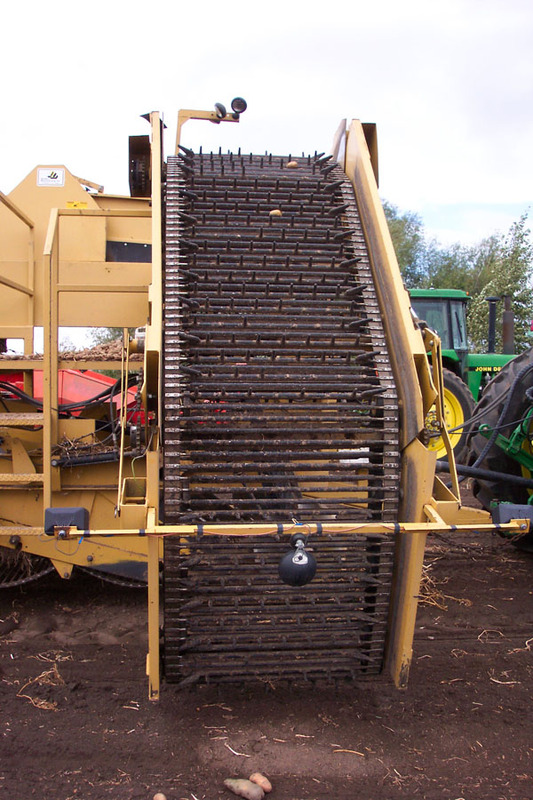 Blades enter the ground below the potatoes, picking up all six rows of potatoes (two from the digger, four from the crossover) and placing them on a series of chains. 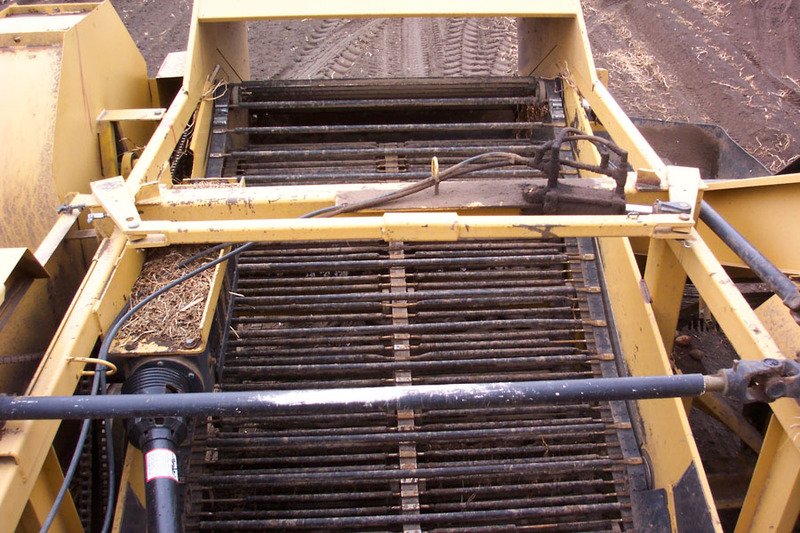 This chains lead to a cross chain that moves the potatoes to the elevator chain that then carries the potatoes up to the boom. 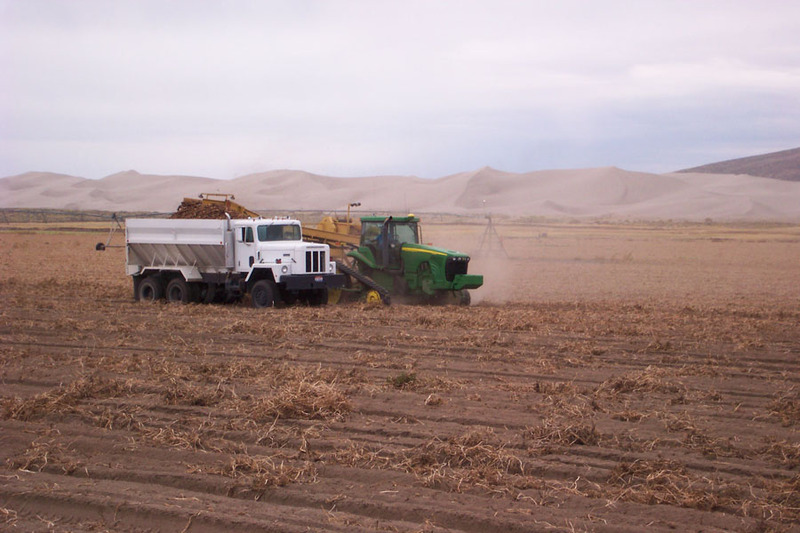 From the boom, the potatoes are loaded into a truck that drives alongside the digger. 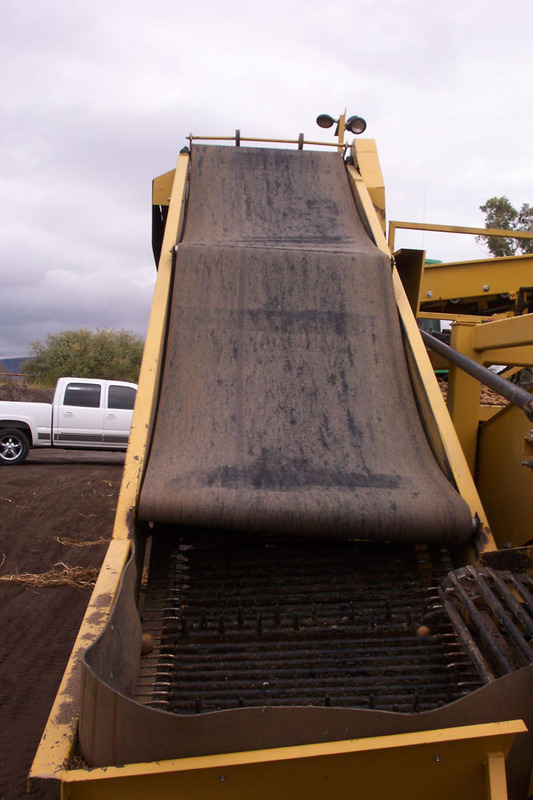 The boom lifts and extends, allowing the digger operator to keep from the potatoes from dropping too far into the truck, which can bruise the spuds. 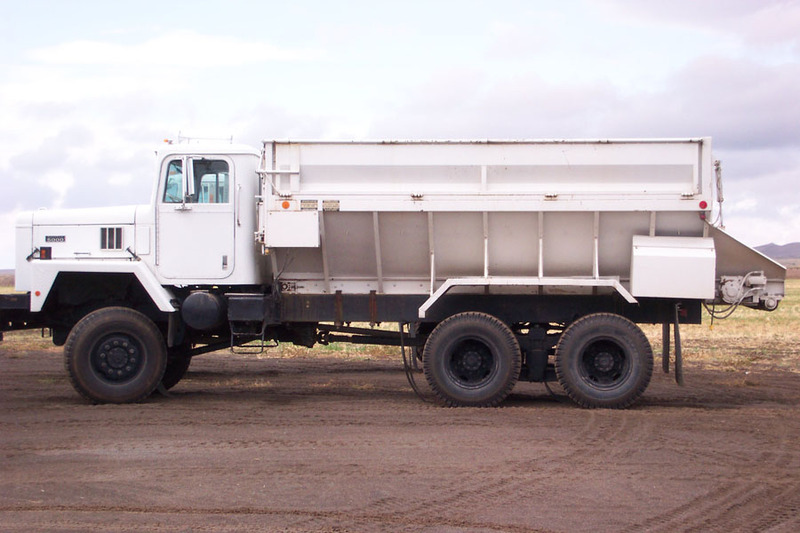 When I work during potato harvest, I drive one of the trucks, like the 10-wheeler pictured below, that goes next the digger and loads the potatoes off the boom. 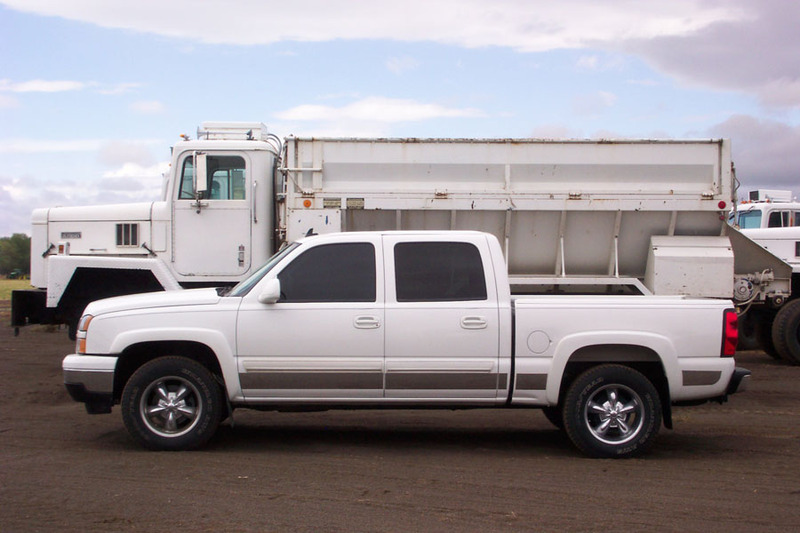 The second picture shows my 1/2-ton pickup parked next to the truck for scale. These trucks are big. The first time I drove I thought this must be what it’s like to drive a tank. 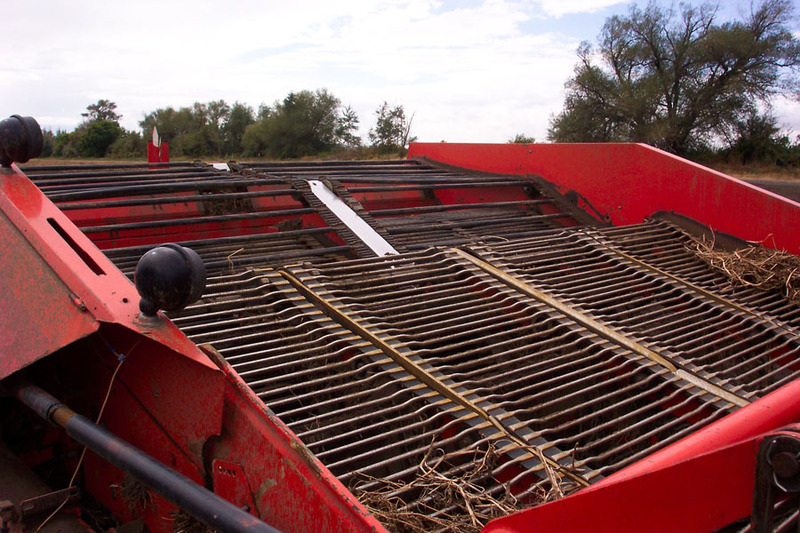 The pictures below show a couple of shots of a truck loading under our four-row digger (works just the two row, but picks up a total of eight rows; 4 digger + 4 crossover = 8 rows of potatoes). 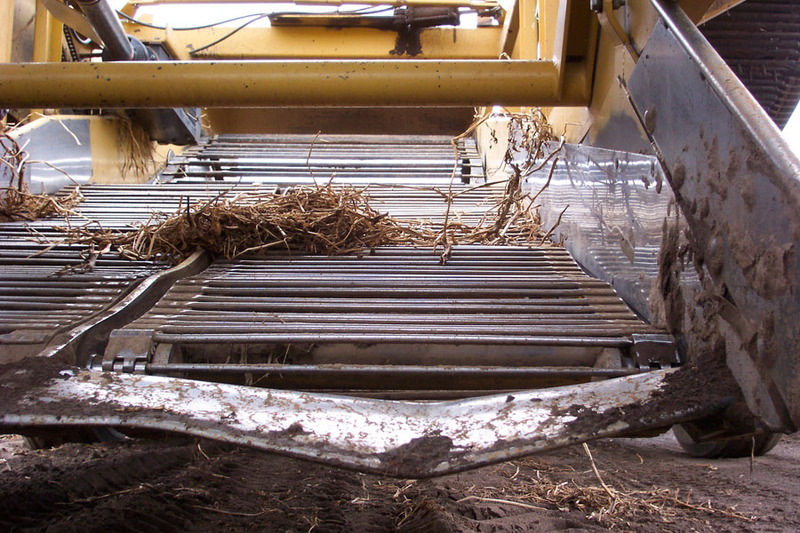 In the picture above, you can see dirt and vines coming the back of the digger. 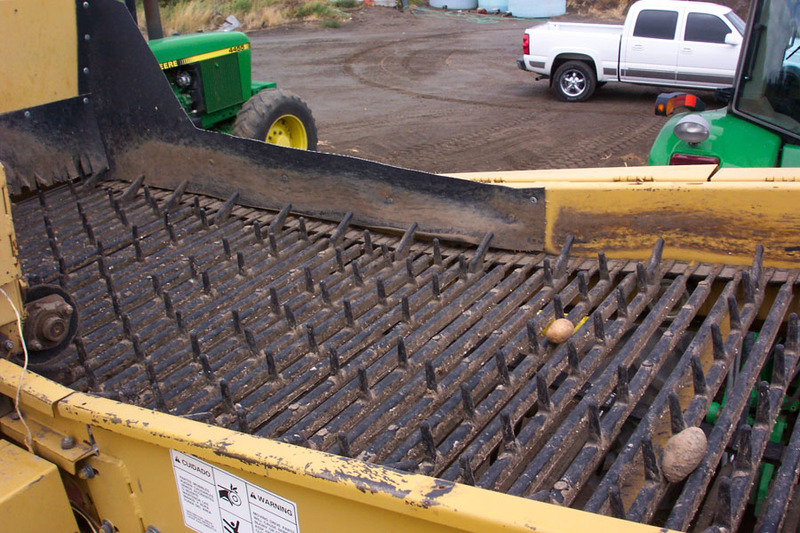 Each digger is equipped with a blower, the piece that extends on the right side, which helps remove field debris from the potatoes. 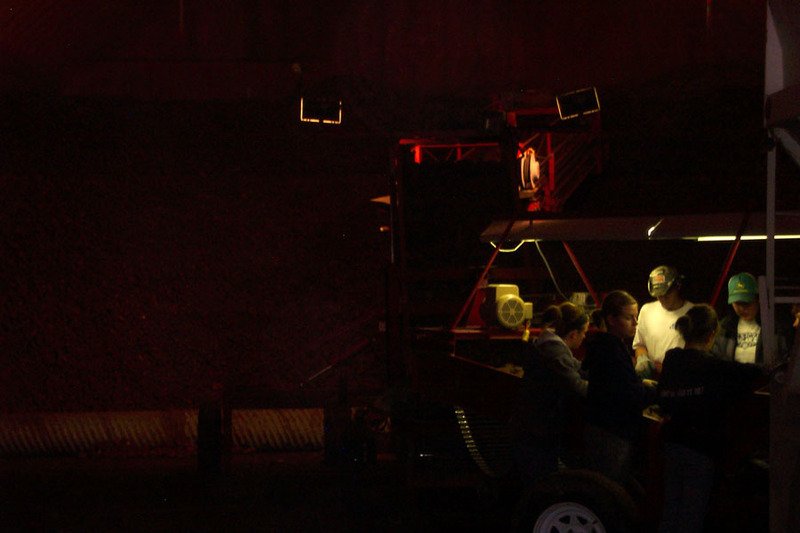 Once the truck is loaded, it backs into a potato cellar and unloads onto a piler. You’ll see both a piler and the outside of a cellar in the photo below. On one of our farms, we have two cellars. Both are approximately 250 feet long (not quite a football field) and 50+ feet wide. 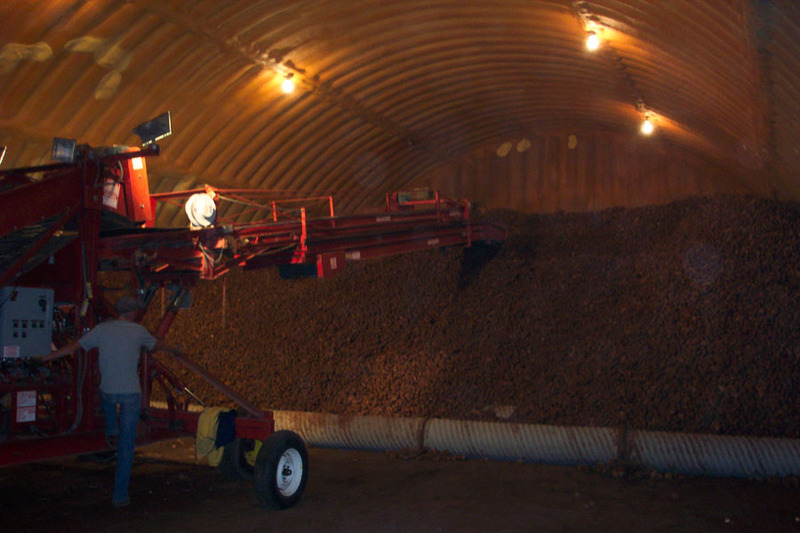 Potatoes stored in bulk require ventilation, so each cellar has an air system that keeps the cellars from overheating during the winter. 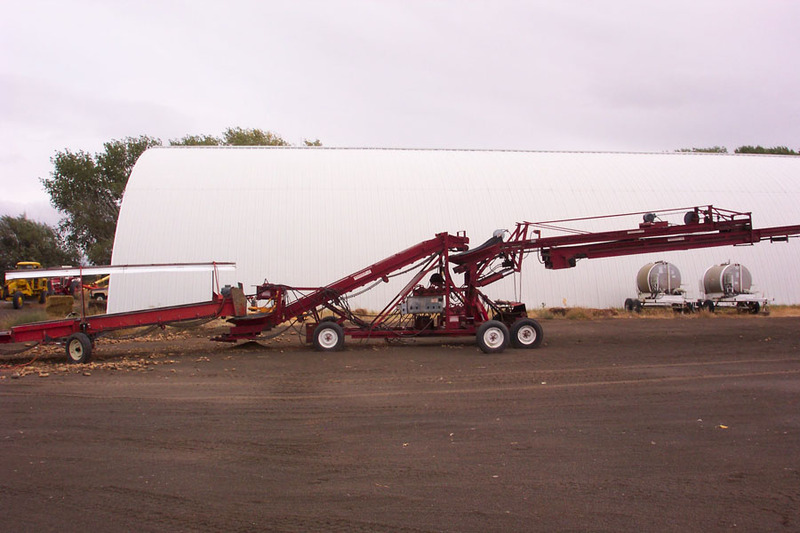 The piler, like the crossover and digger, uses a series of belts and chains to unload the potatoes from the back end of the truck (each truck is equipped with a belt and rear door to move the potatoes out of the bed). We hire a pit crew that stands at the piler to pick out vines, rot, and other debris that made it through the digger. 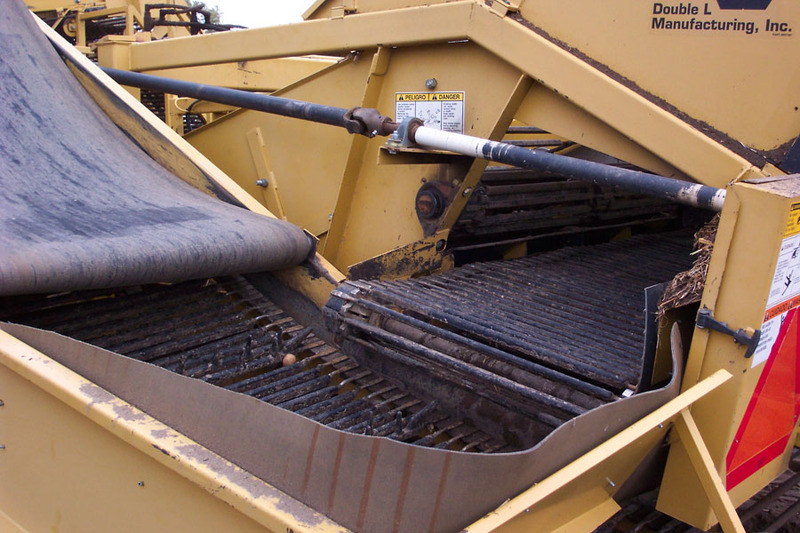 The piler operator then creates piles of potatoes. So now you know what I mean when I say we dig potatoes. I’ve posted all these pictures plus some others on my Flickr account. I’d be happy to answer any questions, too. Frankly, I owe everything I am to growing up on a farm. I learned how to work hard and how to manage a business. I also saw firsthand that even when you’ve given everything you’ve got, sometimes Mother Nature, or other forces, will smack you around just because they can. Then, you have to figure out another way. Growing up, there were definitely times I loathed living on a farm. It always meant work and more work. Now, I realize it gave me a work ethic I wouldn’t trade for anything in the world. I’m a big proponent of technology and the other amazing crafts that have come about. But I’m also keenly aware that if we didn’t have farmers it would be incredibly difficult to fuel ourselves in pursuit of new things. Happy harvest!